The Brim head and display light by Tech Lighting features a handsome and industrial design while delivering on functionality. The ultra-slim head features field-changeable optics and an optional decorative glass collar. The latest advances in technology deliver an extremely powerful LED head without the bulk typically needed to conceal a driver and manage thermal performance. 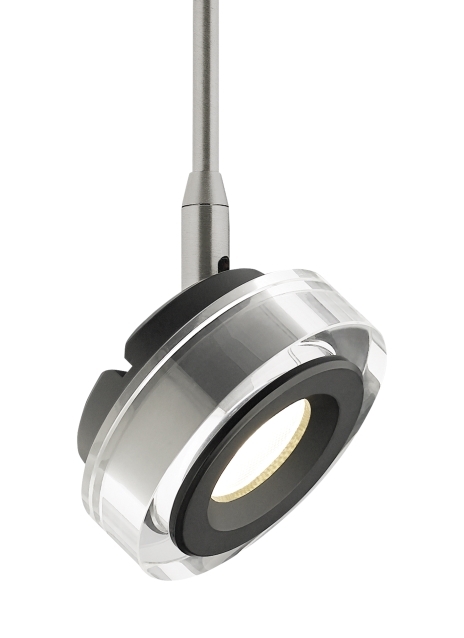 The Brim head is highly customizable and is compatible with the Monorail and Monopoint systems by Tech Lighting. This low-voltage display head is ideal for commercial and residential lighting applications. The Brim ships with an integrated lens holder to accommodate two dimmable lenses or louvers (both sold separately). Includes field replaceable 7 watt, 680 delivered lumens, 2700K or 3000K field replaceable LED module Dimmable with low-voltage electronic or magnetic dimmer (based on the transformer) Choice of 20°, 30° or 40° field changeable optics. Integrated lens holder accommodates up to 2 lenses or louvers (sold separately) As a general rule when using the Brim head, we do not recommend using greater than 33% of the maximum wattage specified for the low voltage transformer due to inrush current requirements. For assistance in calculations, please contact Technical Support. Length -- Choose -- 5" 8" 14"